Swiss farmers have used bells on their cows for centurties, to decorate the lead cow, to comfort and calm the animals and to help the farmer to locate his herd. 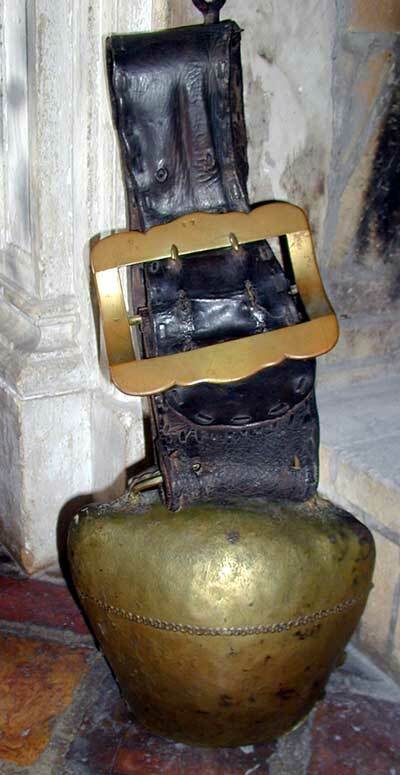 Originally the bells were also said to help ward of evil spirits. Swiss Cow Bells come in two basic shapes. The shape shown here is known in German as a "Treichel" and the other shape, which looks like a traditional church bell, is known as a "Gloche." Treicheln are handmade, where as Glochen are cast in a mold. The process of making a Treichel bell is physically arduous and can take 15 to 20 hours. This beautiful old hand-forged bell and leather collar most likely date to the late 19th Century. The buckle appears to be more recent. Perhaps a rambunctious cow broke the original one!